Decorative tiles make unusual and distinctive gifts. Mix or match from several designs in each line and create a coaster set with 4"x4" tiles. Use larger tiles as trivets, like 6"x6". Just add felt or cork protectors to the back of each tile. Some tiles also look great framed or can act as stand-alone object d'art in a kitchen or garden. This hand-glazed bird-themed tile by Eartha is a great choice for a thoughtful gift. It even comes with a built-in niche for easy hanging. Cement tiles are hand-made and are not kiln-fired like traditional ceramic tiles. There is very little energy used in the manufacturing process other than human energy. Since they are not kiln-fired there is no combustion of fossil fuels and no green house gases are produced. Cement tiles, like most cementitious products, is made of commonly found, natural occurring compounds like limestone, certain clay minerals, and gypsum. These hydraulic cement products are plentiful and not considered "harsh chemicals" that can damage the environment. Since each tile is handmade, a large labor force is required distributing wealth among a large group of families in developing countries. 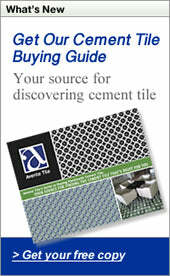 Consider cement tiles for the durability, and exquisite design possibilities; but, don't forget they are green product!